There’s a Bally Nitro Ground Shaker in England with a very peculiar history. The pin was built in Chicago in 1980, and it now sits in a house in Farnborough, one of many pins in the collection of Matt Adams. But what’s interesting is what happened to it in between. It involves an abandoned ship, a very large crane, a lost phone number, and countless flasks of hot tea. The story starts with a ship called the Duke of Lancaster which in the fifties and sixties cruised around England, Scotland, Scandinavia and the Mediterranean and also served as a ferry. Its state rooms, luxurious cabins and silver service restaurants made it one of the finest ships around at the time. At the end of the sixties it was converted to a car ferry, and until 1979 it then shuttled cars and passengers around the British Isles. Now here’s where things start getting interesting. If you’re old enough to remember the late seventies and grew up in Britain, you’ll remember the draconian Sunday Trading laws. Most shops had to shut, pubs had to stay shut or their opening times were severely restricted, and many forms of entertainment were banned altogether. But ships were exempt from these laws. Ships in British waters, ships in dock, and even, it turns out, ships that happened to be on parked on dry land. If you were on a ship, in other words, you could have fun. So at the end of the seventies the ship was bought by a man called John Rowley, with a plan to turn it into an entertainment centre that could open on Sundays. And that’s why on August 10, 1979, the Duke of Lancaster was beached at Llanerch-y-Mor in North Wales and the Funship was born. 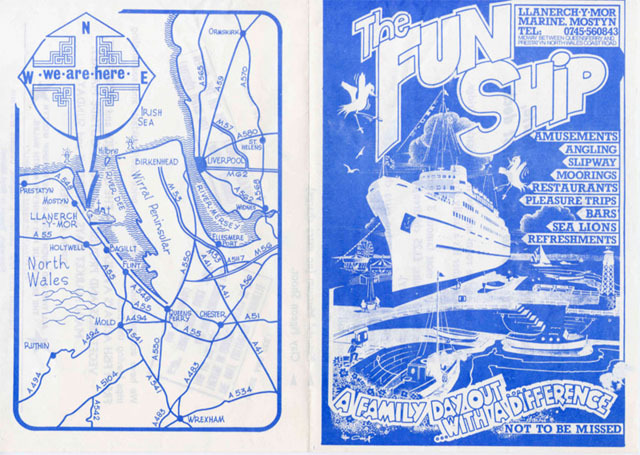 The Funship had restaurants and cafes, it had a disco, it had a cinema, and it had bars that served alcohol on Sundays. 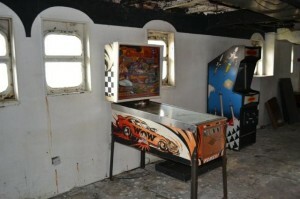 But most importantly for this story, the car deck was converted into a huge amusement arcade. It had children’s ride-on toys, one hundred and fifty odd video games, and also six pinball machines – four Ballys: Harlem Globe Trotters, Nitro Ground Shaker, Dolly Parton, and Supersonic, and two Williams: Time Warp, and Tri-Zone. 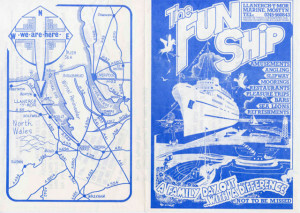 The Funship was hugely popular. But the Funship’s success was also short lived. That’s because within a few years the local council forced it out of business for health and safety reasons: access to the ship was via a road under a rail bridge, and the bridge was too low for emergency vehicles to pass through. So the shutters went down on the bar, the arcade games and pinball machines were switched off for the last time, and the vessel was locked up and abandoned. 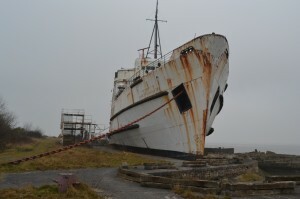 The Funship became a ghost ship, slowly rotting in the Welsh sea mist. Fast forward almost thirty years, and enter two urban explorers known as Crashmatt and Ashless. Urban exploration is the sport of accessing and photographing abandoned structures: warehouses, factories, hospitals, and, apparently, ships. Crashmatt and Ashless managed to get on board the rusting Duke of Lancaster, and explored the ship from top to bottom. 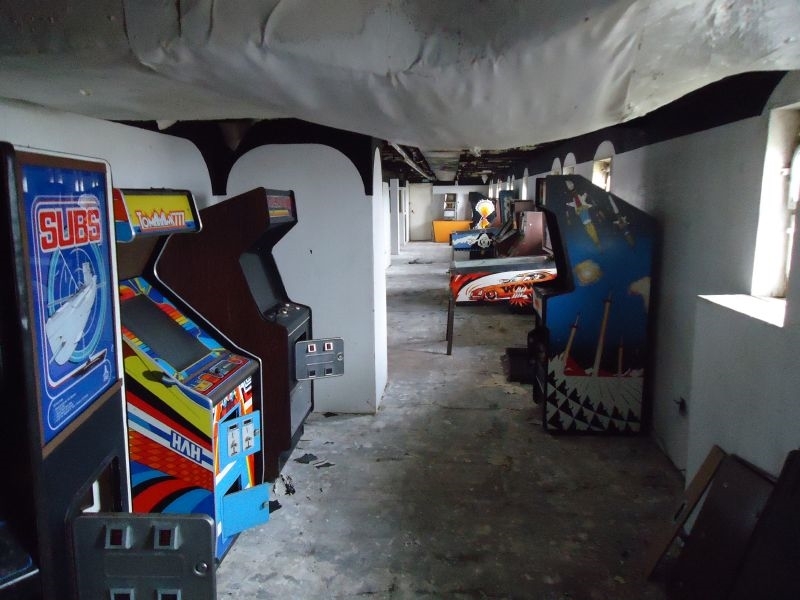 They published photos of their urban exploration escapade on a website called 28dayslater, including pictures of the amusement arcade with its video games and pinball machines. One way or another, the photos came to the attention of Oliver Moazzezi. Oliver is a technical architect from Southampton, but he’s also a pinball and video game fanatic with a collection of machines. A big collection: about one hundred and twenty video cabinets and ten pins at the last count. And the photos blew his mind. There, on a ship in North Wales, was the mother of all barn finds: over one hundred and fifty arcade games and six pinball machines, hardly used, one previous owner. “The pictures were quite dark, but I could see all these machines in the arcade and I was just thinking ‘Oh my God,'” he says. There followed about a year and a half of researching the ship, finding the owners and tracking down the right people to talk to about the machines. 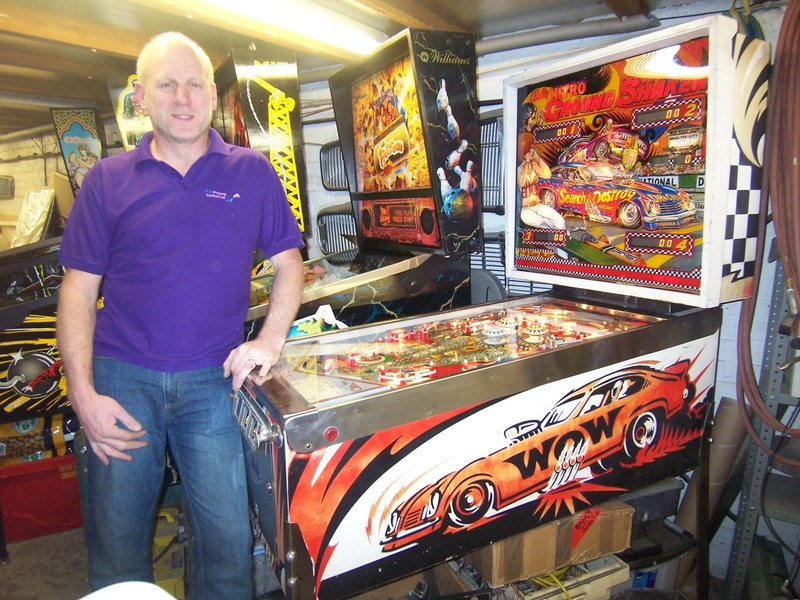 Eventually Oliver got in contact with Damon, one of the grandsons of owner John Rowley, and arranged to meet at the ship to take a closer look at the machines along with a couple of other games enthusiasts, Andy Welburn and Dom Escott. “The boat is huge and it is pretty hard to get on board. The only way was to climb up the anchor chain,” Oliver recalls. They made their way to the arcade, and there were the machines, just as they had appeared in the urban explorers’ pictures. They were dirty, and a little tarnished, but by and large they seemed very little the worse for wear from having been abandoned since the early eighties. “We then spent about three hours going through all the machines and documenting them, noting if they were missing any parts and describing their general condition. We also drew up a floor plan,” says Oliver. What followed first was silence. Oliver contacted the owners to try to work out a deal to buy the machines, ringing weekly, and then monthly. Each time he was told that they would call him back. But they never did. Then panic. In December 2011, the BBC’s Coast program featured the Duke of Lancaster. 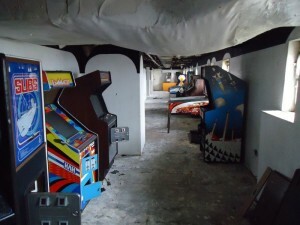 If the footage revealed the presence of the long forgotten arcade then dozens of collectors would be after the machines. Oliver watched in horror as the ship appeared on national television… but miraculously and to his huge relief, no shots of the arcade were shown. And then he got wind that someone else had discovered the horde of machines and had been enquiring about a price. Finally he managed to get in touch with John Rowley’s son, and discovered that they had not been in contact because… they had lost his phone number. The good news was that they were willing to sell the machines, and Oliver agreed to meet Rowley’s son at the ship once more to check that the machines were still there, and then to agree a price. But when he got to the ship, things had taken a turn for the worse. The profile of the ship must have been raised by the BBC’s Coast program, and since the last visit thieves had plundered the ship. The good news was that they had left the machines alone, but the bad news was they had taken the brass portholes for scrap. That meant the arcade was open to the elements in places, and water was coming in. The machines had survived almost thirty years, but they wouldn’t last much longer. Time was running out. They told me ‘You have ten days to get the games out due to the work that will happen on the ship. Once this work starts it will be too late to get the games. At last, in January 2012, Oliver managed to agree a price for the haul. There were frantic negotiations as a third party tried to hijack the deal, but after a last minute price hike he had himself a deal for the entire arcade. At this point Oliver’s life went in to overdrive. 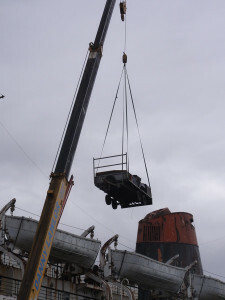 He rounded up a group of sixteen people to split the haul, and looked around for an eighteen ton crane, along with a crew to operate it and a flatbed trailer to use to unload the machines from the ship. There were several crane hire businesses in the area, but one in particular caught his eye. “The company was called Lawlor. Pat Lawlor is my favourite pinball designer, so it seemed like a good omen,” Oliver says. The team converged on the ship from around the country – and in fact parts of Europe – and on the morning of February 4, 2012, they went in to action. “It was an insane day,” says Oliver. “We got on the ship, loaded the machines up, and somehow we craned them all off in an hour and a half. I only wanted four machines, but we divided them up, loaded them in to vans and trucks, and drove them all off. Most of the pinball machines went to Dom Escott, and the Nitro Ground Shaker went to his friend Matt Adams. “As you could imagine, the machine didn’t work when I got it,” says Matt. “There was a fair amount of rust on the metals parts from the salty air, and all the playfield inserts had dropped out, or were loose,” he says. “More to the point, the battery on the MPU board had leaked, so I had to get that repaired.” The machine had been situated on the boat between two portholes, so the back box was a little faded at the back, but other than that the cabinet itself was in surprisingly good nick, he adds. About three months after being rescued from the Duke of Lancaster, and some thirty years after it was last played, the Nitro Ground Shaker had been restored to working order, and finally it was ready to be switched on. And that’s where it sits now, just another machine in Matt’s collection. Albeit one with a very remarkable tale to go with it.